Finish Measurement: Approximately 6 X 8 inches. 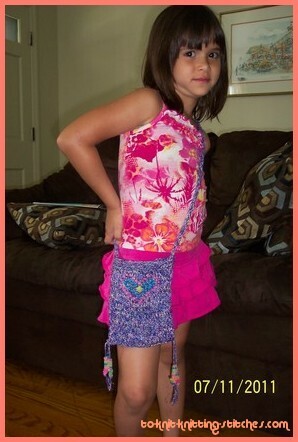 I made two of these shoulder bags for my five years-old twins to keep their paper and crayons in one place when we go out to restaurant or for them to put their personal collections. This is my first time knitting with beads. I wasn’t so sure what to expect. I asked the twins what they each wanted the designs to be on their bag. They both chose the heart shape. The girls were very happy to help selecting the beads for their bag. Once I had some idea of the shape and color I wanted for the bag, I drew a heart shape design on a piece of a paper (a graph paper would be better). 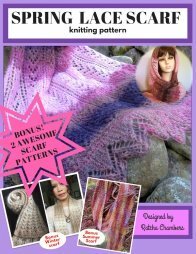 You can download graph papers at www.theknittingsite.com for free. 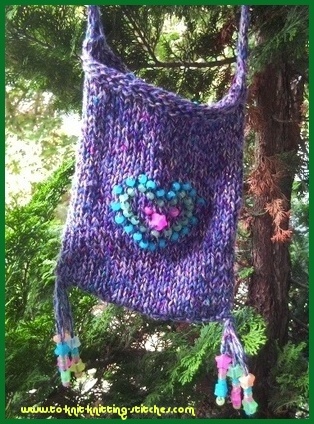 The first bag turned out good, but I wasn’t really happy with the way the beads looked at the tip of the heart. So, I added another row of bead to get a better look heart and the result was much better. Both of my girls just love their shoulder bags and have been wearing them around the house and out to dinners all the time. - 30 Pink Beads, 19 Blue beads, and a star bead (substitute with any colors and shape you like). The beads must have holes big enough to thread the yarn through. Thread the beads according to the diagram with the chosen yarn using tapestry needle. Start threading the bead from the top left corner of the chart. In this case, start from the left side of row 12. Make you way toward the right until you reach the end of the row. Then return to work on the left side of row 11 and move to the right. Continue working this way with the rest of the rows until the end. Note: I knit this pattern from the bottom to the top, so I had to thread my beads from the top down. 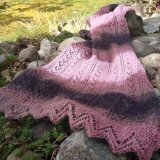 Pushing all the beads away from the tip of your yarn, begin cast on 25 stitches. Continue to knit in stockinette stitch until piece measure about 10 inches from the beginning. 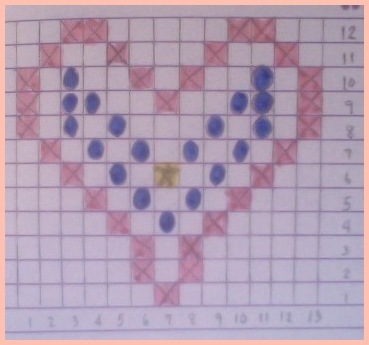 Begin knitting with beads following the chart diagram. Slip each bead toward the front of the stitches as indicated. Be extra careful with the 2nd and 3rd rowsContinue working until the piece measure 15 inches ending with the right side. Next row (wrong side),Knit 6 rows and bind off all stitches leaving the last stitch on the needle. Row 1 (right side): Slip 1, k2.Row 2: Slip 1, p2.Repeat row 1 and 2 until the strap is at your desired length. Bind off all stitches. Cut of yarn leaving 10 inches tail for attaching the strap and the bag at the end. With right side together, sew both side seams together. Sew each ends of the strap near each side seams. Adjust the bead to appropriate arrangement if needed. You can add many fringes as you like to your shoulder bag. I added 3 fringes with beads at the bottom of the bag. The twins liked it when the beads swung and make clicking sounds. I think that's all to it. If I missed out anything, please let me know.